I thought it would be fun to take a look at my planner(s) section by section. Since I was asked (quite a while ago - sorry) to do a post on how I manage my to do list, I thought I would start with my to do list section first. I actually manage my to do lists differently for work versus personal. This is because I have a lot more tasks for work than I do for personal, and it requires a lot more structure. So this post will focus on work task management. I have a section in my planner specifically for my to do list. I use the JEN action planner notebook pages and cut and punch to fit the A5 planner. I like these pages specifically because each page is numbered, as well as each item on the list. So if I want to refer to a task, I can do it by number (e.g. Page 4, line 3 I use Page:Line naming convention on the list). 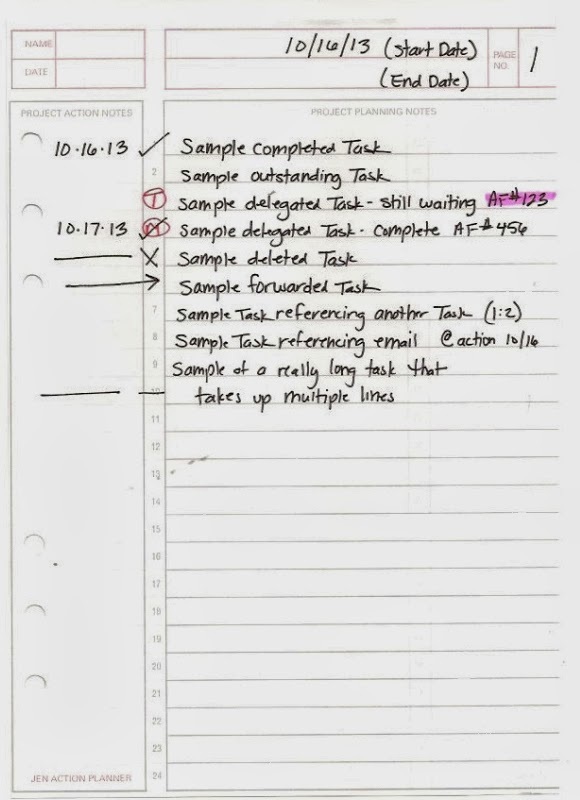 It also has a column next to the task where I can put a date completed. I can quickly glance at a page and know which items are outstanding. When I process meeting notes, any action items get transferred to my to do list. If I'm on a call, any action item goes on the to do list. If I get an email, I move it to my @action folder in Outlook and add the task to my to do list. Of course, if there is something I can take care of right away, I do it instead of writing it down. The to do list is for tasks that I can't get to or complete immediately. I don't usually schedule specific to do's for a specific time, I just block out chunks of time on my calendar to work on my to do list. Then I scan through my list, pick the task that I need to work on, and start working. When the task is complete, I put a checkmark through the number and write the complete date next to the task. If I need to delegate a task, I circle the initial(s) of the person it has been delegated to. Once the task is completed, I check off the number and write in the date completed. If the task has a specific tracking number associated with it. I write down the number and highlight it with a Frixion highlighter. Once the item is complete, I erase the highlight. This makes it easy to see which ones are outstanding. If I need to delete a task, I X out the number and draw a link through the column where I normally put the date. If I need to postpone the task or move it to my 'someday/maybe' list, I draw an arrow through the whole number and column where I normally put the date. Once a page of tasks is complete, I put the date I finished the page under the start date and draw a line through the page. Usually I paperclip the completed pages together, and the paperclip also acts as a bookmark to mark my spot in the to do section. Please let me know in the comments if you have any questions or want more info on my process. I love, love, love this system! I especially like you code for delegation. I have been using @Name to delegate, mostly to my husband, but now I'll start just circling the letter of his first name. LOL! I love, love, love your blog! I read it every day. I'm so glad you got some inspiration from me. Thanks.